Lazarus was a close friend of Christ, from Bethany, about three kilometers east of Jerusalem. He lived there with his sisters Mary and Martha, and they often gave hospitality to Jesus (Luke 10:38-40; John 12:1-3). John the Evangelist informs us (John 11) how one day Jesus was notified of the death of Lazarus. Four days later He arrived in Bethany, not only to bring comfort to Lazarus’ grieving sisters, but to show the power of God and perform His greatest miracle by raising him from the dead, in anticipation of His own resurrection. The resurrection of Lazarus brought short-lived great admiration and fame to Jesus, as evidenced by his triumphant entry into Jerusalem, but it also provoked great anger among the teachers of the Law. Now they wanted both Jesus and Lazarus dead. 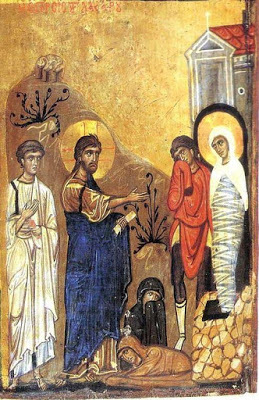 Lazarus escaped, but Jesus did not. But what happened to Lazarus? 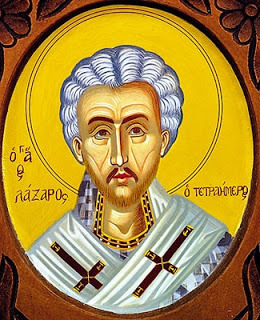 According to St. Epiphanios of Cyprus (367-403), Lazarus was thirty years old when he rose from the dead, and then went on to live another 30 years following his resurrection. Another tradition says that Lazarus fled the anger of the Jews and took refuge at Kition in Cyprus around 33 A.D. 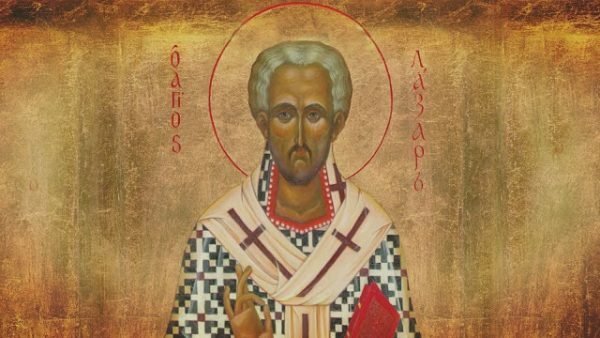 While in Cyprus, Lazarus met the apostles Paul and Barnabas, as they were traveling from Salamis to Paphos, and they ordained him the first Bishop of Kition. He shepherded the Church of Kition with great care and love for eighteen years until the end of his life. There are traditions which say he was sullen and never smiled after his resurrection, and this was due to what he saw while his soul was in Hades for four days. Some say he never once laughed, except one time when he saw a man steal a clay vessel, and he uttered the following saying: “One earth steals another”. “If you see it dried up like salt, then let it become salt,” responded Lazarus. In this way the entire vineyard became a salt marsh. Workers who collect salt in this area today confirm this tradition. They claim to find when they dig there roots and trunks of vines. It is said that in the middle of the salt lake today there is a well of fresh water, known as “the well of the old woman”. The Synaxarion of Constantinople, speaking of this tradition, says that the lake was claimed by two brothers, who broke ties for its possession. To end the dispute, the Saint by his prayers dried up the lake and it remained salty. Another tradition says that the Theotokos came to Kition with John the Evangelist in order to meet Lazarus. St. John gave him clerical vestments and cuffs, and then they went to Mount Athos. Above the sarcophagus there was built a beautiful church, which was renovated in 1750. His memory is celebrated by the Church every Saturday before Palm Sunday. The transfer of the relic of St. Lazarus from Kition to Constantinople, which took place in 890 by order of Emperor Leo VI the Wise is celebrated on October 17th. Emperor Leo wrote the idiomelon for the Vespers of St. Lazarus. The transfer of the relic of St. Lazarus is detailed for us in two pane gyric homilies delivered by Bishop Arethas of Ceasarea (850-after 932). After extolling the arrival of this great treasure to Constantinople in his first homily, he describes in the second the procession formed with the presence of the Emperor when the relic arrived from Chrysoupolis to Hagia Sophia. In exchange for this transfer, Leo VI sent money and artisans to Cyprus, where he built a magnificent church to honor St. Lazarus, which is maintained until today in Larnaca. Furthermore, he built a monastery in Constantinople dedicated to St. Lazarus, in which he placed the sacred relic. To this same monastery was later transferred the relic of St. Mary Magdalene from Ephesus. It later became a custom for the Emperor of New Rome to worship at the monastery on the Saturday of Lazarus. Not too many years ago (specifically November 23, 1972) the superintendent of the Department of Antiquities, who worked towards the restoration of the church in Larnaca, found a sarcophagus with bones beneath the pillar supporting the plate of the Holy Altar. The bones were in a wooden box, placed in the sarcophagus, which in turn had carved on it the word “friend”. This finding seems to confirm the tradition that Leo VI did not take the entire relic of St. Lazarus to Constantinople, but left a portion behind. Authentic testimony and evidence for this fact is the location where the bones were found: under the Holy Altar. Moreover, Arethas does not mention an incorrupt relic, but “bones” and “powder”. Also, a Russian source at the library of Oxford reports that a Russian monk came from Pskov Monastery in the 16th century to Larnaca, and he venerated the bones of St. Lazarus, taking a small piece for himself as well. This piece is preserved till this day in the Chapel of Saint Lazarus at Pskov Monastery. Based on this account, we can affirm that the relic of St. Lazarus was venerated in Larnaca in the 16th century. A later account is not known, so for some reason, probably for protection, the Kitians hid the relic beneath the Holy Altar until it was discovered in 1972.